Tracy Lundeen has spent a lifetime of connecting business and entertainment in a mutually beneficial way that provides a spectacular experience for his audiences while providing a platform for local and regional businesses to meet face-to-face with their customers. Through his original company, ShowPro he worked with the City of Duluth to create Bayfront Festival Park and Fourth Fest, Duluth’s annual 4th of July celebration. He went on to create several more events that have spanned decades in the Duluth area – including the Duluth Wedding Show and Northland Senior Expo. 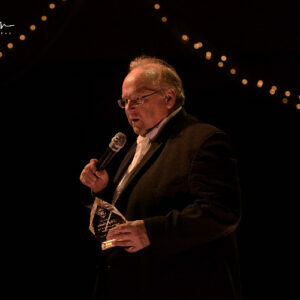 He reinvigorated the Duluth Women’s Expo, and partnered Engwalls Florists, Greenhouses and Garden Centers to create the Engwalls Corn Maze and Agri-tainment Center, and with Twin Ports Entertainment to create the new Taste of Duluth event that takes place annually in Bayfront Festival Park. Always a pioneer in the world of wedding planning, Lundeen created a new type of event for 2018. The Gitche Gumee Wedding Show showcases Duluth as a destination for weddings and invites couples to our community to start their “happily ever after” while enhancing the areas tourism industry. Lundeen is the host of “Talk of the Town with Tracy Lundeen” and top-rated magazine radio show that airs every Saturday from 6:30 AM – 8 PM on KDAL-AM and 95.7FM. The show discusses local topics with guests and has repeatedly ranked number one in the Neilsen Ratings. In 2014, Lundeen honored his mother, after her passing, by creating a foundation that supports youth in the arts. The Bluebird Foundation provides funding for high school kids in the performing arts through grants, scholarships, and advocacy. Applications are accepted twice a year and several $500 scholarships are awarded. Since it’s inception the organization has given away more than $20,000 in scholarships to area kids. Lundeen is active in the Duluth community, his compassion for local issues and businesses comes in second only to his family. He is a dedicated father and grandfather, never missing a chance to attend a grandkid’s science or art fair, or dance competition, and a fierce supporter of his children’s ambitions. Awarded “Tracy Lundeen Day” by Mayor Ness and the City of Duluth in 2013 for his contributions to the community, he remains one of the most respected businessmen in the area. He manages to find the humor in wearing so many “hats”, making him a favorite to do business with, as well. In his downtime, he likes to head to the peace and calm of the lake with this family, but typically, he ends the day sharing a brandy or two with his pup and pal, Bella, a sheltie. 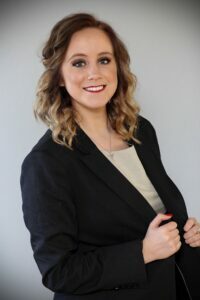 Kynze Lundeen serves as Vice President of Lundeen Productions. Working at the company since she was right out of middle school, she has learned the ropes, has had years of hands-on experience, and is an expert in organization when it comes to planning events. Kynze specializes in Wedding planning and is the producer of the Duluth Wedding Fashion Show, the largest fashion show in the region. Outside of weddings, she works hand in hand with President of the company, Tracy Lundeen ensuring that all of event guests, and businesses, are treated like royalty and are meeting their expectations.